Hizb ut-Tahrir (HT, حزب التحرير, Arabic for "Party of Liberation") is a quasi-Salafi Islamist international organization which advocates for the establishment of a totalitarian, fascist (Islamic) state, the only difference from the ethnic-cleansing lunatics being not taking violent approaches; they poison people's minds. From this aspect, you may as well call them Sneaky DAESH. Their main ideological goal is basically to replicate the Abbasid Caliphate by creating pan-Islamic global empire which unites all the Muslim societies (ummah) under the Sharia rule and reenacting the caliph. Once this mission is achieved, they will proceed to subjugate the rest of the world spread their heartwarming Sharia rule by any means necessary. They are yet another organization, like Taliban and DAESH, which aims for implementing strict Sharia rule including hudud penal code, which conducts chopping hands for theft, stoning for adultery, and death penalty for apostasy. There's also jizya (non-Muslim tax) and all sorts of other "non-Muslim sanctions." Not to mention public gender segregation and requirement for Niqab. HT was established by a Palestinian Muslim organization in Jerusalem during the 1950s. [note 1] They were in a course of decline until the War on Terror happened and rekindled Islamic defensive consciousness and decreased the reputation of the West among the Muslim population. HT is banned by several countries including Germany, China, Russia, Turkey, and all the Arab world except Yemen, UAE and Lebanon. However, they still have branches in some Western countries including in the US, UK and Australia. Unlike DAESH which is universally condemned by ordinary Muslims, HT has rather more significant footholds and this is what makes them inherently scarier than those knife-wavering assholes. Estimated membership could reach up to one million, but it's unclear. Their strategy for recruitment and gaining support is to stir the victim mindset among Muslims by invoking several geopolitical crises happening throughout the Muslim world. In the Netherlands, HT is focuses on the Israel-Palestine conflict, and in the UK, they use issues of Kashmir and Hindu-supremacism to evoke how bad Muslims need unification to stand up against the oppression. Its best not having war literally all over the Muslim world. HT is known for operating based on highly distorted and fantasized conceptions of the state, history and the modern world. Their first and foremost error is regarding the caliphate itself, which is their supposedly top priority. HT aims for the creation of the caliphate as a unitary state (not even a federation), where the caliph is held accountable to the populace, with all the power and functions of the state, including appointing and dismissing government and military officials. The caliph even would have no limitation on his period in office. Women cannot be appointed to govern, and while caliph is said to be committed to the minority rights, non-Muslims don't have a say in his election. Needless to say, these things are contradictory, and there's no clarification on how the caliph could manage the state by popular consent while acquiring a totalitarian level of power at the same time. Historically, a caliphate wasn't always unified; empires such as Abbasids and Ottomans had several vassal states operating in far-reaching areas, some of which even opposed to the central administration in Baghdad or Istanbul, respectively. The actual Abbasid and Ottoman eras didn't have strict Sharia rule enforced, which is contrary to what is envisioned by HT and others of their ilk today. Some historians even mention that homosexual practices reached the highest level during the caliphate time, especially among the ruling classes. Hudud law was considered there for "deterrence" effect and its application was quite rare (stoning occurred only once in the 500 years of Ottoman history). Whatever the caliphate that they are visioning, it is highly plausible that it is not reality-based. HT considers all the Muslim societies and communities as the potential territory of the caliphate. This includes the Muslim majority area of non-Muslim states including Chechnya, Moro (southern Philippines), and East Turkestan. Once they are incorporated into the caliphate, secession is absolutely not permitted, and they are required to fight the secessionist "even if" it leads to "the killing of millions of Muslims." As you may expect, some lands and territory ruled by Muslim powers during the course of the history such as southern Spain, Sicily, northern India and the Balkans are considered part of this caliphate, so Spain you're fucked. HT shows a communist-level of hatred toward capitalism, albeit their definition of capitalism is fluid, which they consider a political system of democracy and freedom, separation of church and state, human rights and religious pluralism. Democracy is criticized because it gives "sovereignty" to the people, which is supposedly only held by the divine political system. Any Muslims who believe in democracy are not real Muslims. They are also highly critical of large corporations and exploitations. Unsurprisingly, HT is against human rights which they consider as a byproduct of the capitalist system. Ironically, while Muslims within the HT's caliphate may enjoy the biggest freedom among all the other social groups, their freedom would be severely limited when they contradict the caliph because the caliph is ordained the ultimate authority over Muslims, regardless of whatever injustices or human rights violation he commits. HT is also highly antipathetic towards pluralism and tolerance, and calls for Muslims not to participate in democratic institutions across the West and urging people not to integrate. Interestingly, HT often borrows language and expressions of socialism, anti-neocolonialism or social justice discourse of the West. Critics point out the Marxist-Leninist undertone, and resemblance to socialist student movement. They refer to sexism, racism, imperialism, inequity, etc. as social ills that are inherent in Western society and can only be cured through Islam. This is a tendency which can be observed on non-Wahhabi Islamist movements including the Muslim Brotherhood. [note 2] This is most probably because they are feeding to the alienation of Muslims from the "Western" political and economic systems, which in itself may be a valid resentment, but not necessarily entails support to the HT's alternative. While HT's goal is to establish a unified caliphate, and this goal is shared among other similarly extremist Islamist organizations, as is the case with all the dogmatic ideologies, infighting is more than common between them. HT and DAESH have been in a bitter feud. Reportedly, DAESH executed senior HT member for questioning Baghdadi's eligibility as a caliph. HT is also having hard times reconciling with Hamas, an offshoot of Muslim Brotherhood in Gaza. HT sees the Taliban in a better light though, and called for Jihad against NATO-led invasions of Afghanistan. Below is a simple chart for comparisons of these usual suspects. ↑ However it is wrong to frame them within the issue of Israeli-Palestinian conflict. Their reach is far wider than mere Palestine, and it may be more plausible to consider them as an extremist organization with worldwide ambitions happened to be created by Palestinians. ↑ Wahhabism is indifferent to the discourses of colonialism or social justice. See Saudi Arabia. ↑ Is establishment of a caliphate ultimate goal? ↑ Is implementation of strict Sharia including hudud code a principal goal? ↑ Is violence permitted as a main method? ↑ Do they hate the capitalist infidel pigdogs? ↑ Is killing "fake" Muslims religiously sanctioned? ↑ Muslim Brotherhood is highly fractured entity and some branches in certain countries no longer uphold Sharia. ↑ Ostensibly, they claim to have renounced violence. When they took over in Egypt, that went out the window. Plus, not all MB groups even officially renounce violence, such as Hamas. ↑ Ostensibly not anti-Western, but anti-semitic, though they are willing to pretend to get along with Israel if it means fending off the Shia. ↑ "Can the Muslim world really unite?". March 4, 2010. http://www.hizb.org.uk/islamic-culture/can-the-muslim-world-really-unite. Retrieved 15 January 2016. ↑ Commins, David (1991). "Taqi al-Din al-Nabhani and the Islamic Liberation Party". The Muslim World 81 (3–4): 194–211. http://users.dickinson.edu/~commins/TaqiAl-dinAl-Nabhani.pdf. ↑ Taji, Mustafa (1 November 2013). "How Muslims should tackle hudood correctly (video)". http://www.hizb.org.uk/videos/how-muslims-should-tackle-hudood-correctly. Retrieved 23 March 2016. ↑ "Hizb ut-Tahrir al-Islami (Islamic Party of Liberation)". GlobalSecurity.org. http://www.globalsecurity.org/military/world/para/hizb-ut-tahrir.htm. Retrieved 19 March 2014. ↑ "Islamist groups urge Muslim Danes to boycott election, saying democracy ‘incompatible’ with Islam". rt.com. 5 June 2015. https://www.rt.com/news/265309-islam-danes-not-vote/. Retrieved 23 February 2016. ↑ "Hizb ut-Tahrir". Counter Extremism Project. http://www.counterextremism.com/threat/hizb-ut-tahrir. ↑ "Q&A: Hizb ut-Tahrir". BBC News. 10 August 2007. http://news.bbc.co.uk/2/hi/uk_news/4127688.stm. Retrieved 15 January 2016. ↑ 15.0 15.1 Malik, Shiv (13 September 2004). "For Allah and the caliphate". New Statesman. http://www.newstatesman.com/node/195114. Retrieved 19 March 2014. ↑ DIAB, KHALED (2 July 2014). "The Caliphate Fantasy". New York Times. https://www.nytimes.com/2014/07/03/opinion/the-caliphate-fantasy.html?_r=0. Retrieved 5 March 2016. ↑ Abbott, Nabia. Two Queens of Baghdad: Mother and Wife of Harun ai-Rashid (Chicago: University of Chicago Press, 1946) pp 210-211. ↑ Brown, Jonathan. Stoning and Hand Cutting—Understanding the Hudud and the Shariah in Islam. Yaqeen Institute. Retrieved February 22, 2018. ↑ "Taqi Al-Din Al-Nabhani and the Islamic Liberation Party" (PDF). Users.dickinson.edu. http://users.dickinson.edu/~commins/TaqiAl-dinAl-Nabhani.pdf. Retrieved 2015-03-18. ↑ An Open Letter to the Muslims in Britain regarding the Dangerous Call of Integration’. ↑ Glazov, Ramon (July 2014). "The caliphate’s troll vanguard". Overland. https://overland.org.au/2014/07/the-caliphates-troll-vanguard/. Retrieved 13 February 2016. ↑ Frances, William Scates (12 February 2015). "Why ban Hizb ut-Tahrir? They're not Isis – they're Isis's whipping boys". The Guardian. https://www.theguardian.com/commentisfree/2015/feb/13/why-ban-hizb-ut-tahrir-theyre-not-isis-theyre-isiss-whipping-boys. Retrieved 14 January 2016. "something like the Muslim equivalent of a Socialist student movement. Its prominent members are mostly tertiary-educated and imagine themselves as a sort of Muslim consulate to the West." ↑ "Capitalism: of the rich, by the rich and only for the rich". January 28, 2014. http://www.hizb.org.uk/current-affairs/capitalism-of-the-rich-by-the-rich-and-only-for-the-rich. Retrieved 17 March 2016. ↑ Lacey, Robert (2009). Inside the Kingdom: Kings, Clerics, Modernists, Terrorists, and the Struggle for Saudi Arabia. Viking. p. 56. ↑ "ISIS executes senior Hizb ut-Tahrir member in Syria". Hizb ut-Tahrir Central Media Office. 5 Pillars UK. 21 November 2014. http://5pillarsuk.com/2014/11/21/isis-executes-senior-hizb-ut-tahrir-member-in-syria-without-trial/. Retrieved 14 January 2016. ↑ "Afghan Biographies. Hizb-ut-Tahrir". 2015-11-23. http://www.afghan-bios.info/index.php?option=com_afghanbios&id=3422&task=view&total=3261&start=1187&Itemid=2. Retrieved 29 February 2016. ↑ Filiu, Jean-Pierre (June 2008). "Hizb ut-Tahrir and the fantasy of the caliphate". https://mondediplo.com/2008/06/04caliphate. Retrieved 7 March 2016. "Hizb ut-Tahrir candidates did subsequently run in Jordan’s national elections even though Nabahani was exiled to Syria from 1953–1959. After another expulsion, from Damascus to Beirut, he then decided to reject elections and concentrate on creating an underground structure"
↑ "ISIS down to 6,500 fighters, holds only 3 percent of Iraq". Washington Examiner. 17 October 2017. http://www.washingtonexaminer.com/isis-down-to-6500-fighters-holds-only-3-percent-of-iraq/article/2637810. ↑ "Boko Haram leader escapes". http://saharareporters.com/2018/02/20/boko-haram-leader-shekau-escapes-nigerian-army-arrest-bbc. ↑ "Despite Massive Taliban Death Toll No Drop in Insurgency". Voice of America. Akmal Dawi. http://www.voanews.com/content/despite-massive-taliban-death-toll-no-drop-in-insurgency/1866009.html. Retrieved 2014-07-17. ↑ 56.0 56.1 See the Wikipedia article on Iran–Saudi Arabia proxy conflict. Hizb ut-Tahrir (February 2011). 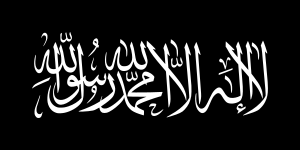 The Draft Constitution of the Khilafah State. Khilafah. http://www.hizb.org.uk/wp-content/uploads/2011/02/Draft-Constitution.pdf. Abdul Qadeem Zallum (2000). How the Khilafah was Destroyed. London: Al-Khilafa Publications. http://www.khilafahbooks.com/wp-content/ebook-download/english/khilafah/how_khilafah_was_destroyed.pdf. Hizb ut-Tahrir (2005). The Institutions of State in the Khilafah: In Ruling and Administration. London:: Hizb ut-Tahrir. http://www.ht-bangladesh.info/sites/default/files/books/Ajhizah.pdf. Zeyno Baran, ed (September 2004). The Challenge of Hizb ut-Tahrir: Deciphering and Combating Radical Islamist Ideology. CONFERENCE REPORT. The Nixon Center. http://www.islamawareness.net/Deviant/Hizb/confrephiztahrir.pdf. Hizb ut-Tahrir Britain (29 March 2010). "Hizb ut-Tahrir Media Information Pack". http://www.slideshare.net/abusenan/ht-media-pack. Kadri, Sadakat (2012). Heaven on Earth: A Journey Through Shari'a Law from the Deserts of Ancient Arabia .... Macmillan. ISBN 9780099523277. https://books.google.com/books?id=ztCRZOhJ10wC&printsec=frontcover&dq=Heaven+on+Earth:+A+Journey+Through+Shari%27a+Law&hl=en&sa=X&ved=0CC0Q6AEwAWoVChMIob7syrnZxwIVhg6SCh0fYg3Z#v=onepage&q=Heaven%20on%20Earth%3A%20A%20Journey%20Through%20Shari'a%20Law&f=false. Hizb ut-Tahrir (2010). The American Campaign to Suppress Islam. https://mayamuslimah.files.wordpress.com/2010/06/the20american20campaign20to20suppress20islam1.pdf. Ahmed, Houriya; Stuart, Hannah (2009). HIZB UT-TAHRIR IDEOLOGY AND STRATEGY. Henry Jackson Society. http://henryjacksonsociety.org/wp-content/uploads/2013/01/HIZB.pdf. Karagiannis, Emmanuel (2010). Political Islam in Central Asia: The Challenge of Hizb Ut-Tahrir. Routledge. https://books.google.com/books?id=vmKNAgAAQBAJ&pg=PA112&lpg=PA112&dq=hizb+ut+Tahrir+prophet+violence&source=bl&ots=Gnpiie2HHq&sig=TyiQsNaAYt7i6ohkhSax0CfcTPc&hl=en&sa=X&ved=0ahUKEwjJw9iN7anKAhUCJ5QKHUyhDtEQ6AEIMDAC#v=onepage&q=hizb%20ut%20Tahrir%20prophet%20violence&f=false. This page was last modified on 9 March 2019, at 05:34.